Note tent and small black dog to the right of it! 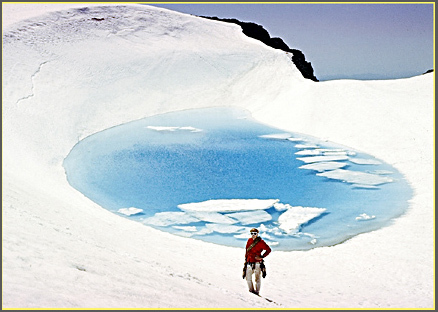 We are camping on the edge of a very recent volcanic crater; the permanent ice choking its mouth has been measured at about 200 feet thick. The photographer and his husky Kaila spent a spectacular night in the summit crater of South Sister....... the memory is of a feeling of Polar Emptiness embraced by nearby stars........ 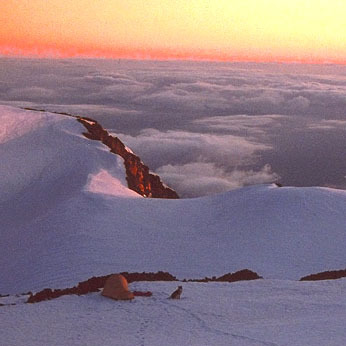 In the morning, the sea of clouds below looked like something you could dance on. What is Central Oregon's record-coldest city? Ski-touring high on the east side of the North Sister. It's a trail-less area where you won't be bothered by crowds. Picture compliments KJs Upholstery, Bend. My favorite downtown Bend eating spot? The riverside delights of Bend's Pine Tavern, a local restaurant and icon since 1936, overlooking Mirror Pond. 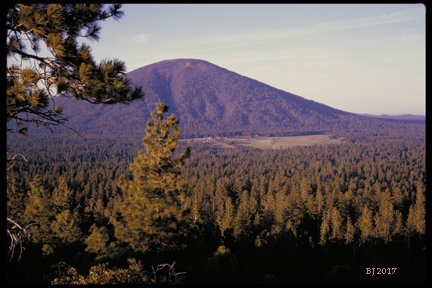 Below is a picture of that Central Oregon icon, Black Butte, elevation 6,436. At its foot runs the major highway from Salem and Eugene, Hwy 20, and in the large meadow is the very upscale Black Butte Ranch, a place that I used to work in the role of head of the Cross Country ski program. 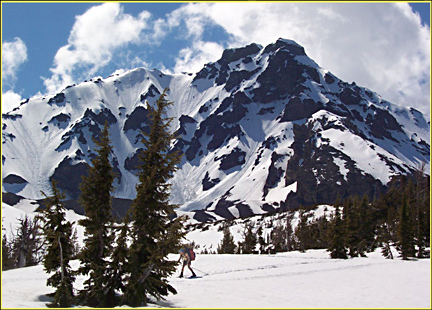 Click below to be transported to additional Central Oregon Mountains, and also sections on the historic Pacific Crest Trail, historic wilderness shelters and fire lookout towers (many pages!). 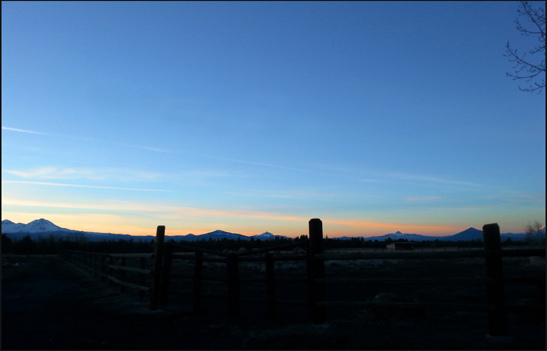 Above: a cold winter night settling in upon Central Oregon. Middle and North Sisters on the left, Black Butte on the right, and the edge of Mt. Jefferson on the extreme right.